Read em while its hot. What better way to start off your Monday! Disclaimer I am not calling anyone out to insult them. Doing so to acknowledge your stellar play and maybe asking you to spoil us a little more. jAk. Istanbul vs. Beirut - Remember when Istanbul finished the regular season as a number one seed? That feels like ages ago, doesn't it? They have the same group of guys but it hasn't amounted to the same success for whatever reason. They have been missing Adam who is more than capable of being 'their guy' but Mahmoud seems to want that label at this moment. Mahmoud will have his hands full with Nick early Saturday morning. He's been quite the past few games but I see that streak coming to an end this week. Mingo put in 13, 7, and 5 but b/c we know the type of player he is, we tend to expect more. 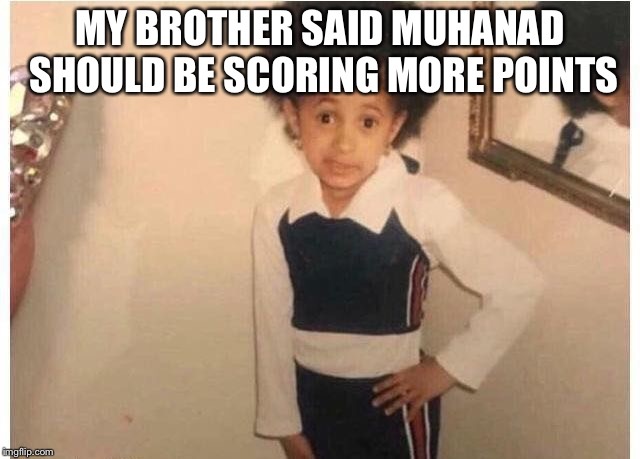 Especially against a team that was twice his age. I'm sure he isn't all about stats but his team's success does rely heavily on his play. Beirut won't be tested until the regular season finale against Mombassa, so eat up bro and rack up some MVP numbers. Dhaka vs. Sana'a - Whoever said Farzad hasn't been the same player is bugging. 17, 4 and 5 and yall want to erase the man from the league's best guards? Cmon now. They defeated a very good Tehran squad while also taking care of the basketball. Another great start to the season for the always contending Dhaka squad and despite not getting the same amount of love as their core 4, Salman has been solid as well. Keep balling guys. Sana'a on the otherhand has won two in a row. The Imran brothers combined for 34, and with this team's defensive personnel will make this game competitive. Ultimately Dhaka takes this one. Tehran vs. Fez - After a nice start, Tehran has suffered back-to-back losses. I'm sure they are looking at this matchup as a walk in the park, but Fez has been keeping games close. Mo Amin you need to assert yourself down low brotha. 17ppg and 11 rebounds is great mA, but give us 25 and 15 this week, and that will only make Jake's life easier and space the court for your shooters. On the Fez side of things, Musa had a great game. Kabul vs. Jakarta - The last time I had 33 and 23 I was 15 years old and I had just turned off my playstation. 33 POINTS AND 23 REBOUNDS?!?!!? Other teams know he's going to get the ball. They know he's going to score, but he doesn't care. With all due to respect to the other MVP candidates, Abdelhadi has my vote, solely on what he's turn this team into. Lets not forget to mention Hamza Ahmad who has been playing great ball as well. Not that bad of a schedule the rest of the way so they should be seeded pretty high come playoff time. Speaking of playoffs when will the commish return? Himey and company pulled off an upset that no one saw coming. Keeping Sarajevo under 70 this year seemed impossible but below 60 sounds like blasphemy. Credit Jakarta for great game planning and defense. Two upsets in a row though, I don't think so. Lahore vs. Cairo - The most confusing team to watch this season has been Lahore. Smart basketball player in Ahmad Saleh, great basketball player in Moayad, another good scorer in Hosam and you got Omar 'Trump Tower' Mana. So what gives? Rumors has it this team is more concerned of their individual stats than wins. Going to the scores table at half to check your points doesn't amount to W's. Cairo got that dude AMP. Scored 27 last week on a very uncharacteristic 11-27, so lets say he goes for a 40 burger this week. Another hot take. Goldberg outrebounds Mana. I know not really a hot take since he's 8 foot 8. Cordoba vs. Kazan - GAME OF THE WEEK (if everyone is in attendance). Cordoba was without big Luke Jensen last week and it showed. Normally a team that controls the paint and doesn't allow offensive rebounds struggled mightily against a rejuvenated Mecca squad. Kenny will get his no matter who the opposition is. Jaber is going to facilitate but should look to score more often. Yo Jabby remember that game you had 30 something when we were teammates? How about one of those again. Let's not bring up Patrick's name in this prediction. Frank aka Jenkins is close to having a triple double I feel it. Jose had a cool 15 and oh yeah Pat scored 34 like it was nothing. Dammit so close. This game is a toss up. Jerusalem vs. Baghdad - Jerusalem has been in the news a lot lately. The city not the basketball team..... Baghdad is rolling. Amir had 30, Timmy Brown 19 and 10 a highlight reel coast to coast layup from Ahmad Farag. This team is legit and will compete during playoff time. Mombasa vs. Suba - Mombasa is in playoff form, so watch out league. Pete Brown with yet another double double. 18, 6 and 5 from Raza, not to mention 14 and 11 from mastaweiss. This team is cooking. Did what they had to do against a shorthanded Riyadh squad and need to keep up the stellar play against what looks like a difficult stretch of games to close out the season. Had a chance to watch Suba this past weekend, and they are a scrappy bunch. I do think they had a very very favorably schedule to start the season and this week will be their first test. Riyadh vs. Islamabad - If Riyadh gets more than 4 people to show up they can keep things close. But Islamabad is just too cold man. Zain and Idris have been the best acquisitions of the season. I think Zain gets some nice revenge against his former mates while Idris makes it rain from beyond the arc. Have fun guarding Kareem Biggz, dude is shifty. I didn’t know 16 points is considered close. 🤷‍♂️ Oh well. Istanbul/Beirut: These are two teams that stuck with almost the same team for many seasons and Istanbul just hasn't been the team they were a few seasons ago. Beirut, on the other hand, is still making noise around the league with every player contributing and playing their role. Anthony Cruz and John Hartenfels don't get enough love. They bring in the hustle, grit, and toughness. Mingo and Nick are the leaders, but Ant Cruz and John are key variables to the equation. Mecca/Delhi: Rumor has it that Delhi no longer believe in each other, trust each other, and no longer want to play with each other. Some of these players are already talking about what teams they're joining next season. They're playing just to play and not to win. We saw a better number 20 last week for Mecca, but I still saw him have his head down after missing a few shots. Keep your head up player, this team isn't going anywhere without you. Mecca also let Khalil Hussein do a little more of controlling the offense and the game, and it brought them a 30 point win. Dhaka/Sana'a: Farzad, Ali, and Ameer get all the love. Fahad and Salman get some, but a person that gets none is Ameer's dad. He comes to every game, every week, keeps this team composed, knows the foul and timeout situation and let's them know. He is truly their coach and he is much more important to this team than people think. I said it last week, and I'll say it again, Dhaka just finds a way to win, and Ameer's dad just might be why. Sana'a is on 2 game win streak, but I don't think they have enough to win against the 3 time champs. Tehran/Fez: Tehran got stellar defense, but their offense just hasn't been playing well enough. This is the game they can figure it out. Fez, you know what I think about you guys. Timbuktu/Granada: Khaled and Shafic can ball, Muj is... However, Granada has the Ahmad bros and Ahmad Sehwail who'll hustle and play defense. Everyone else got to play defense too, get back in transition and guard fast breaks. This is a close one. Kabul/Jakarta: Kabul is top 6 in overall offense and overall defense while Jakarta is 20th in defense. They beat Sarajevo last week, but they lose to Kabul this week. Lahore/Cairo: 2 teams that have promise, that have skill, but just can't figure it out. Omar Mana verse Goldberg should be nice. 2 of the top tier big men in the league. Goldberg needs to touch the ball more and he could win this match-up. AMP verse Moayad. AMP could score, but he has to trust his teammates more, and Moayad is very good player, but he has to worry about winning more than his personal statistics. Another close game, I guess Cairo. Cordoba/Kazan: Well it's going to be either Kazan or Mombasa, we all know it. Jerusalem/Baghdad: Jerusalem kept up with Beirut last week but fell short. Baghdad has too much shooting and too much often for Jerusalem to even keep up. I think Baghdad goes up early and just keeps their foot on the gas pedal. This could easily be a 20-point + victory for Baghdad. Mombasa/Suba: Suba just doesn't get enough love. They play well together and they know the roles of each and every player. Mombasa has more than enough to give Suba their first loss, but Aytac might light it up again. It starts on defense, they need to guard Mo Masri and run him off the 3 point line. They need to limit Raza's fast breaks, and really play team defense and team rebounding against Pete. Alexadria/Sarajevo: Sarajevo had a disappointing loss last week and they bounce back. Jakarta played tough with them and limited Lee's production. Alexandria will play tough, but they don't have enough to win this one.